This is the story of a young medical student's coming-of-age as he watched the defeated British Expeditionary Force shuffling through Oxford in May 1940, and his decision to forego a privileged life that would have led to the fulfilment of a long-cherished dream of becoming a surgeon. After answering the call-to-arms, the reader learns of the author's development from a young, ambitious army officer, through his training in the Indian Army and commissions in Burma and Korea until his sudden resignation 14 years later. Pulling no punches, the author tells of his journeys to many Eastern countries providing vivid descriptions of the people and conditions encountered. An expert storyteller, Bob relates numerous experiences from overseas. Details of his assignments in the Burmese Pegu Yomas display his sense of strict and fair discipline and the stirring narrative of 18 months in the Korean Sami-ch'on Valley demonstrates how Major Maslen-Jones was an officer whose emotions ran deep and were not always easy to conceal. He conveys a rich account of his numerous appointments both abroad and at home, of his successes and failures when the 'slings and arrows of outrageous fortune' found their mark. This is both an absorbing and inspiring story of great human interest. There is no doubt that the author was a career officer with high ambitions, but the reader is also left with the certainty that he was also a man of understanding. Perhaps the wrong man resigned his post. 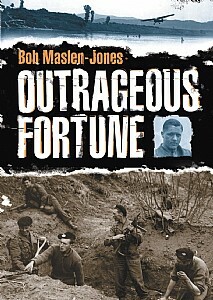 Outrageous Fortune is a fascinating and absorbing account of the author's war-time experiences in Burma and Korea and will be of immense interest to anyone interested in modern history, biographies or looking for a good read.